The Brandenburg Gate (German: Brandenburger Tor) is probably the strongest symbol for The Fall of The Berlin Wall – and The German Reunification. For decades only East German Border Patrol could be seen walking through the gate. Still in 1987 Ronald Reagan was demanding “Mr. Gorbachev, open this gate!” – and only about two years later the gate was actually open. Originally the Brandenburg Gate was one of a row of different gates. Or actually today’s 18th-century neoclassical monument, the Brandenburg Gate as we know it, was built where once a real gate, part of the old Berlin City Wall was located – facing Brandenburg – hence the name Brandenburg Gate. Right next to the Brandenburg Gate, at Pariser Platz you’ll find the iconic Grand Hotel Adlon. Badly damaged during the Second World War it war partly torn down – but then rebuilt in the nineties, after the Berlin Wall came down. Not only the gate itself, but also the area around the Brandenburg Gate is well worth a visit. On the west side of the gate, the public park Tiergarten, the largest inner city park Berlin has many beautiful spots and sights to offer. 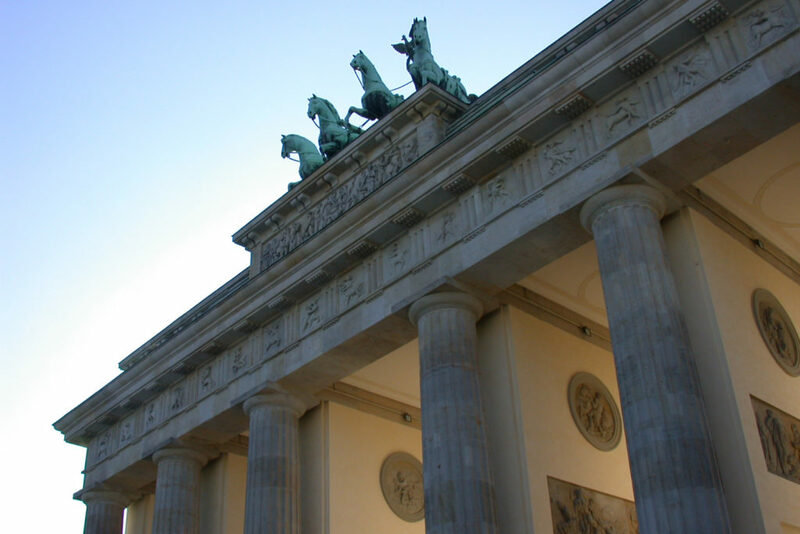 On the east side you’ll find Pariser Platz with the famous Hotel Adlon, the American Embassy and a number of other important and/or impressive buildings. A twenty minute walk down the boulevard Unter den Linden would lead you to Alexanderplatz. On the north side of the gate, in about 5 minute walking distance you will find the Reichstag, where the German parliament is situated. And on the south side of the gate, also about 5 minute walking distance, you’ll find the Memorial to the Murdered Jews of Europe, also known as the Holocaust Memorial – a large 19,000 m2 (4.7-acre) field covered with 2.711 concrete stelae. Walking across the rows is a must – and especially by night this can be a sight to remember. And right next to the Holocaust Memorial you can find the Embassy of the United States of America.